Three General Motors Eastern Aircraft TBM-1C Avenger torpedo bombers of squadron VT-28 prepare to launch from USS Monterey (CVL-26). Several Grumman F6F-3 Hellcat fighters of VF-28 are in the background, also waiting to take off. Together VT-28 and VF-28 formed Air Group 28, commanded by Lieutenant Commander Roger W. Mehle. In preparation for the landings in the Marianas, the 5th Fleet's Task Force 58 attacked targets on Tinian, Saipan and Guam from June 12-18, sinking any shipping and downing any aircraft they could find. Operation of the TBM Avenger from an Independence-class light carrier such as Monterey could be hazardous. Unlike the fleet carriers that carried twice as many Avengers, the light carriers only operated up to nine of them. 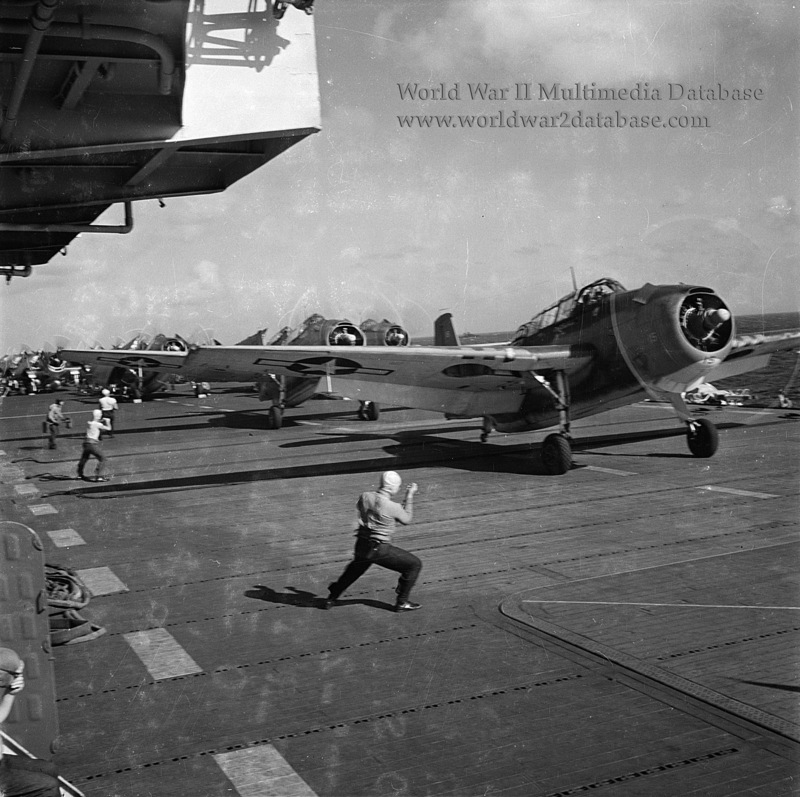 Too heavy to use the ship's single catapult, the TBMs would use as much of the flight deck as available to build up speed to take off. VT-28 lost two Avengers during June 1944. Ensign R. G. Greene, in command of TBM-1C Navy Bureau Number 17042, was missing in action with his crew over Tinian on June 14, 1944. Ensign R. W. Burnett in command of TBM-1C Navy Bureau Number 25711 was lost over Saipan on June 20. His crew was rescued.